Alexander Kostritsyn topped a monster field in event no. 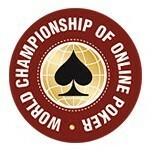 9 of the PokerStars World Championship of Online Poker (WCOOP) to walk away with a first-place prize of $269,284. The two-day event resumed on Wednesday with 93 players, but it was the Russian who took it down outright. Other winners included nilsef and flashdisastr. Event no. 12, a heads-up no-limit hold’em tournament, is still in progress with 64 remaining players. Upcoming events for Thursday include pot-limit Omaha eight-or-better, six-max no-limit hold’em and razz. Check out events 9-12 below. *Based on a deal made at the final table. This event is currently on a break and will resume at 5:00 EST on Thursday. A total of 64 players still remain and they are guaranteed at least $1,384. The winner will receive $78,438. Notables still remaining include Bertrand “ElkY” Grospellier, Matt “Hoss_TBF” Hawrilenko and David Williams. Card Player readers are eligible for deposit bonuses of up to $600. Click on the banner below for additional information.